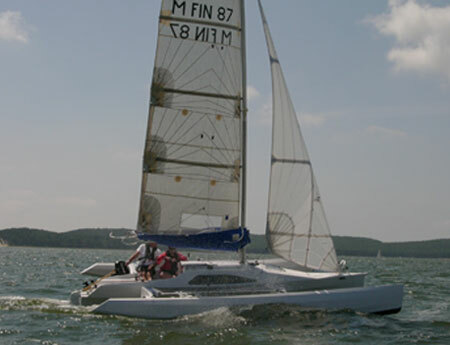 See videos of this boat. See drawings of this boat. See more photos of this boat. 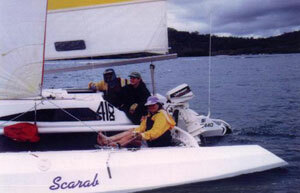 Scarab 670 built by Ray Kendrick. 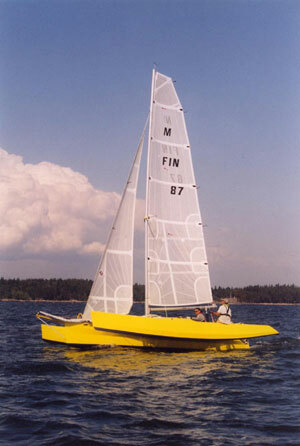 This boat "Scarab" was built by Ray Kendrick using Gaboon plywood covered with glass and epoxy resin. 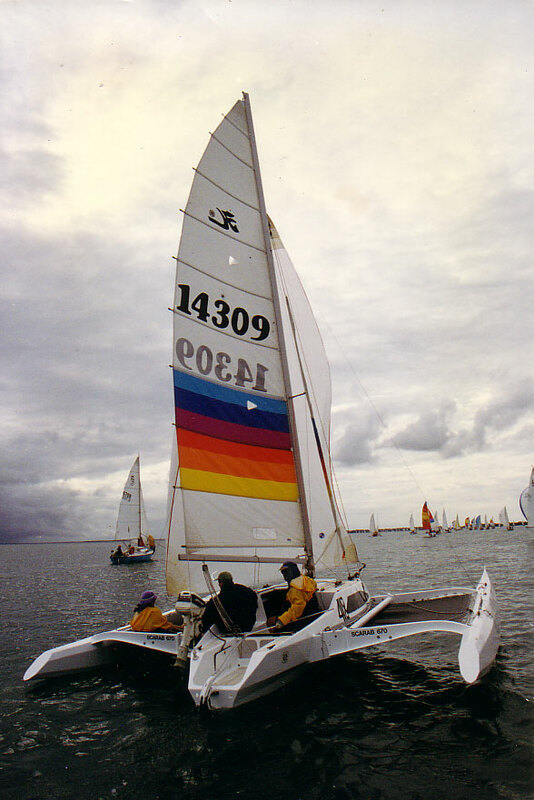 The rig, sails and trailer was from a Hobie 18. 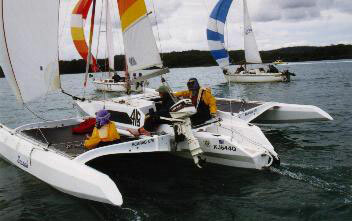 The total cost in 1997 was $13,000 AUD with $4,000 of the total for the Hobie 18. 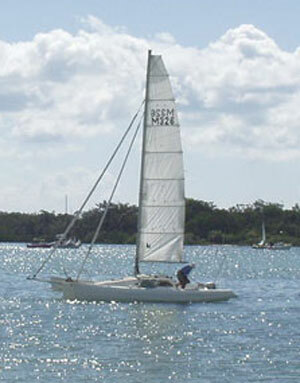 This boat has a large single bunk forward with single port and starboard bunks. These two bunks can be converted to a double at the step level. 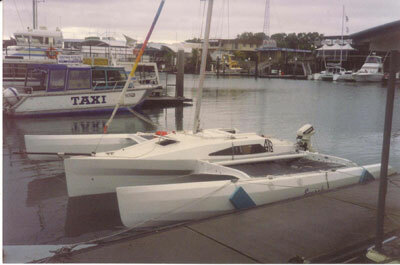 The main hull has no fin case inside which allows for more useable space. 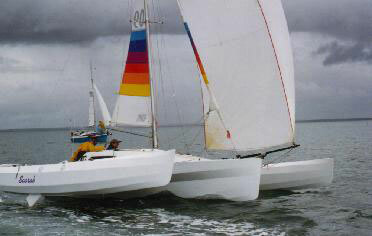 The asymmetrical pivoting fins are in the floats reducing the stress of sailing in thin water. Construction: Multichine stitch and glue plywood, epoxy resin and fibreglass. Beams are fibreglass. Study Plans: sent in PDF format within 24 hours. Study plans are provided to show a dimensioned general layout lan, accomodation and a basic material list. Some other details may also be included. The boat cannot be built from the study plans but are provided for information and basic pricing. Plans: the full plan set is required if the you want to build this boat. It contains all the information and dimensions required. The plans are presented in PDF format. These can be printed on your home printer on A4 size paper or sent to a photo copier to enlarge to A3 size. Plans consist of 39 drawings, Material list and a Building guide in PDF format emailed within 24 hours.